The brilliant yellow, orange, and red leaves are turning brown. 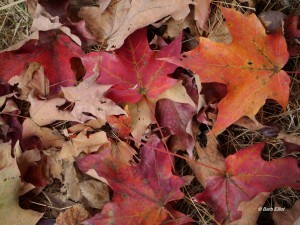 The beauty of autumn is fleeting and soon all the leaves will be on the ground. This “leaf litter” is not trash. The leaves nourish my garden. They’re home to tiny creatures that are essential to my garden’s ecosystem. These leaves are the gift of fall. © Barb Elliot. Click to enlarge. Last year, instead of buying expensive mulch, I mulched with fallen leaves. My trees and shrubs produce leaves abundantly and without charge. Wherever possible, I left them to decompose where they fell. I raked the rest from my lawn into my planting beds. Also, I collected leaves from my neighbors and added them to my garden. The leaves choked out the weeds, retained moisture, reduced erosion, and insulated the roots of my plants against winter cold. A natural fertilizer, they added nutrients to my soil. My plants grew remarkably well this year. Leaf litter (or duff) offers exceptional benefits. Myriad creatures live in the duff and play key roles in the healthy, diverse ecosystem of my yard. Countless microorganisms and tiny invertebrates break down the leaves into basic elements that enrich the soil. Bacteria and fungi accomplish the bulk of decomposition. Invertebrates such as snails, slugs, and earthworms assist in the process and contribute to the web of life in the leaves and soil. 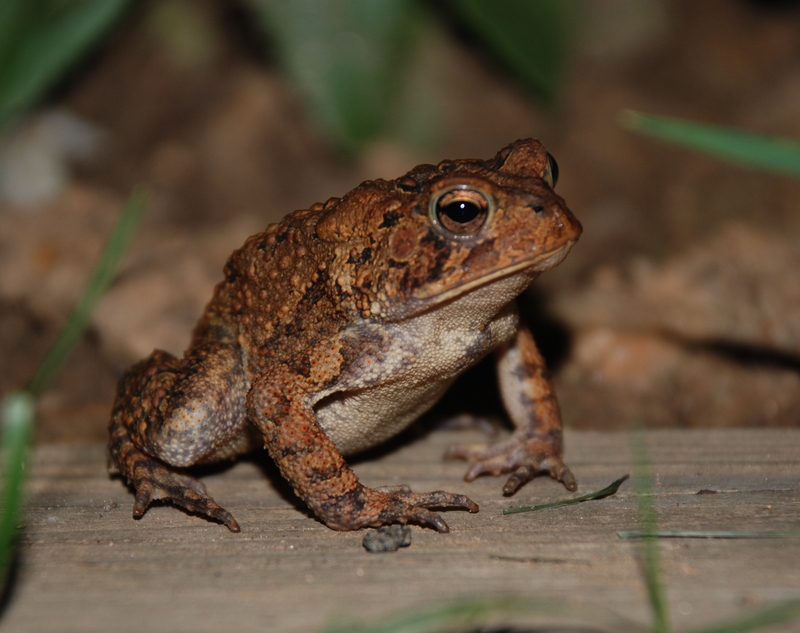 American Toads eat invertebrates in leaf mulch. Jarek Tuszynski photo, Wikimedia Creative Commons. Click to enlarge. Many, many arthropods — creatures with exoskeletons and jointed legs — such as sowbugs, spiders, daddy longlegs, millipedes, centipedes, protruans, and double-tails play an important role, too. Spring-tails and mites, the most numerous, are so small they are rarely observed by gardeners. Many beneficial insects such as crickets, beetles, flies, bees, wasps, and ants also live in the duff. All of these creatures are food for other invertebrates or larger animals such as salamanders, toads, and mice. These in turn are eaten by birds, snakes, or larger mammals. The large and small animals associated with the leaf layer form a natural predator-prey balance in the ecosystem. 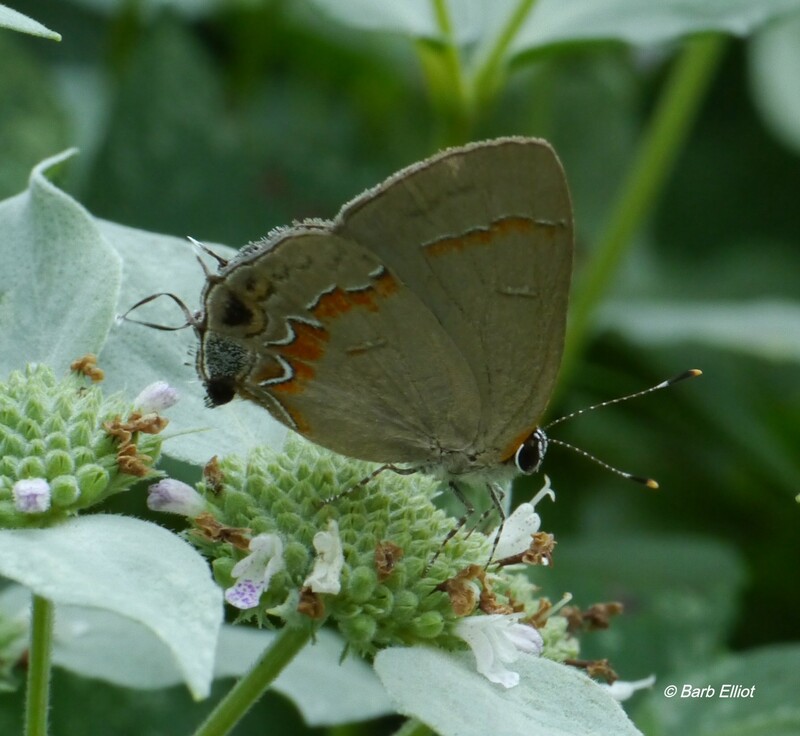 Red-banded Hairstreak on Barb’s Mountain Mint. Photo © Barb Elliot. overwinter in the leaf litter as eggs, larvae (caterpillars), pupae (chrysalides or cocoons) or adults. For instance, the lovely Red-banded Hairstreak, which has visited my yard, lays its eggs on the underside of fallen sumac or oak leaves. When the eggs hatch, the caterpillars eat the leaves and then overwinter in the leaf layer as late-stage caterpillars or chrysalides. Tawny Emperor butterfly caterpillars wrap themselves in a curled leaf and overwinter as caterpillars. Woolly Bear caterpillar in Barb’s leaf mulch. October, 2013. Photo © Barb Elliot. 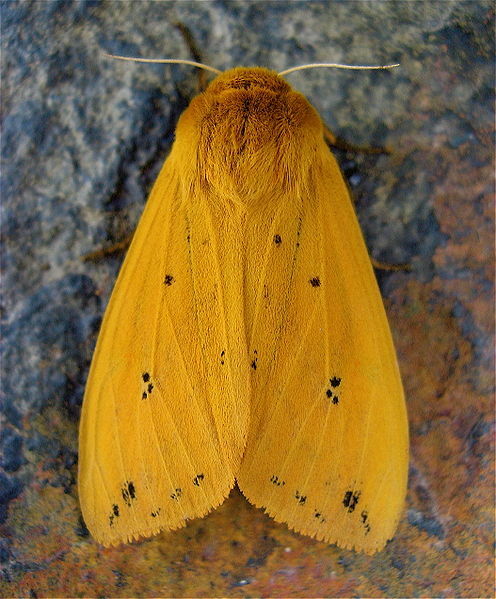 Isabella Tiger Moth – adult form of a Woolly Bear. Steve Jurvetson photo, Wikipedia Creative Commons. 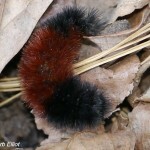 Fuzzy Woolly Bear caterpillars are now searching for good spots under the leaf layer where they will hibernate for the winter. 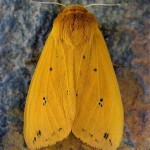 In spring, each will spin a cocoon and emerge as an Isabella Tiger Moth. The Luna Moth, one of our largest and most beautiful moths, overwinters as a cocoon in the dead leaves. Unfortunately, when we treat our leaves as trash, we are also throwing out the butterflies and moths that will grace our yards next spring and summer. 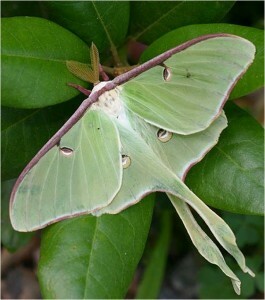 Luna Moth cocoons are found in leaf mulch. Photo © Adrian Binns. 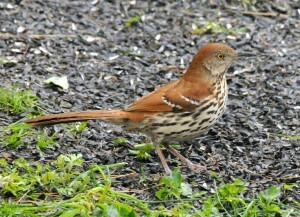 Brown Thrasher. Photo © Howard Eskin. Click to enlarge. leaves of my flower bed. 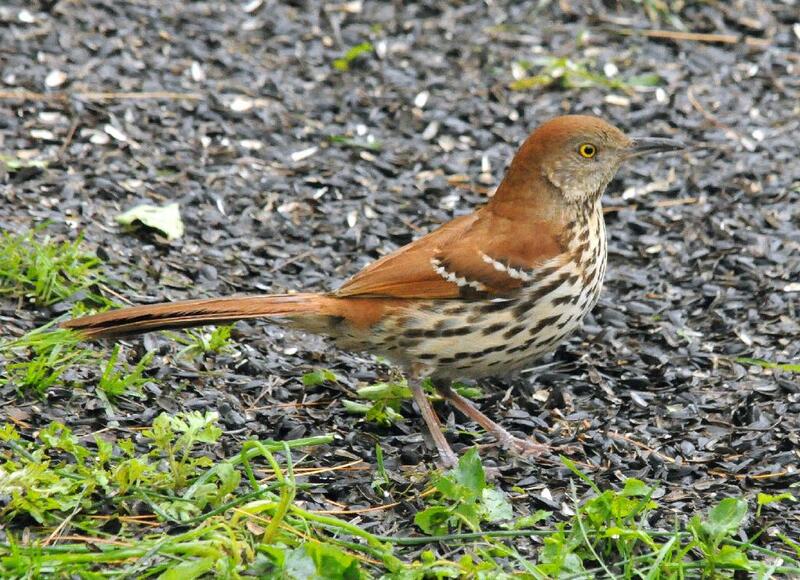 Birds that nest in my yard search the leaf layer for nesting materials such as leaf stems, twigs, and moss. In our society, we are expected to be yard “neatniks”. We conscientiously rake or blow leaves into piles and then stuff them into bags. Picked up at the curb, the leaves end up in a landfill or a huge “leaf compost” pile that smothers beneficial creatures. Personally, I choose to keep all my own leaves and add those discarded by neighbors so they can decompose naturally in my yard. Maybe you, too, will rescue leaves from neighbors. If you want to start small, rake some leaves into a back corner of your yard. Although shredding leaves speeds up decomposition, I refrain for fear I’ll destroy the insects and other animals living there. I’m making a vow. I will never again throw out next year’s butterflies and moths or the other animals that live in my leaf litter. Dead leaves are a gift to biodiversity and the web of life. Leaf mulch is brown gold. I’m joining the new movement* to make fallen leaves socially acceptable as garden mulch. I’m in! Are you? *Borge, Mary Anne. “Red-banded Hairstreaks, Sumacs and Leaf Mulch”. Butterfly Gardener, Volume 18, Issue 3, Fall 2013, 9-11. Johnson, Elizabeth and Catley, Kefyn. Life in the Leaf Litter. American Museum of Natural History, Center for Biodiversity and Conservation, 2002. 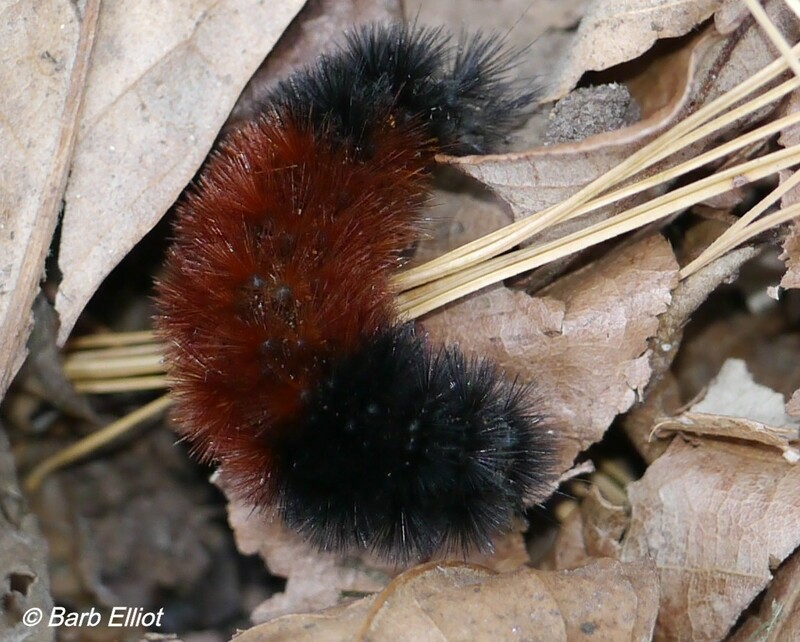 This entry was posted in Native Plants and tagged fall leaves, Isabella Tiger Moth, Leaf litter, leaf mulch, Luna Moth, Red-banded Hairstreak, Woolly Bear caterpillar by barb. Bookmark the permalink. Great, Sandra! I’m so glad you’re joining the movement! Fine article and great pictures. Thanks very much, Lynne. Glad you enjoyed it.